Engage your students in analyzing character traits, feelings, and motives while building critical vocabulary that is essential to understanding characters in literature. This standards-based toolkit contains all the essential resources for introducing and reviewing character traits, feelings, motives, and actions, with vocabulary as an emphasis. All the tools in this resource are specifically designed for teaching RL 3.3 and can be used with any story/passage or reading activity, whether it be with read alouds, guided reading, independent reading, partner reading, during listening centers, or they can even be used as formative assessments. The activities build students' understanding of trait words such as determined, prideful, or cooperative. Students also learn shades of meaning with character feelings such as upset, angry and furious, which assist students' understanding of how these feelings influence a character's actions. Also included are graphic organizers that are designed specifically for determining how a character's motives or actions influence the events in the story. 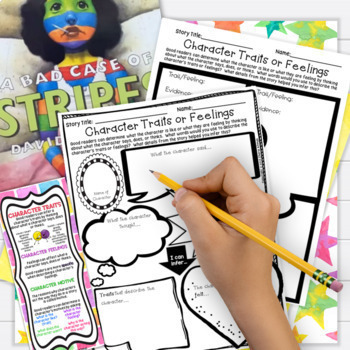 The anchor posters in this toolkit will become students’ go-to resource for identifying and using specific language to describe characters’ traits and feelings when explaining their actions or how they contribute to the sequence of events. 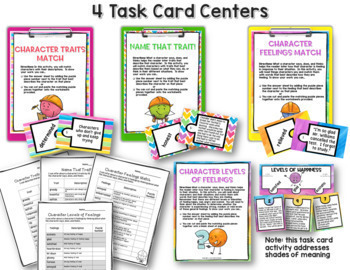 This kit also includes 4 task card center activities to give students additional practice with this standard. 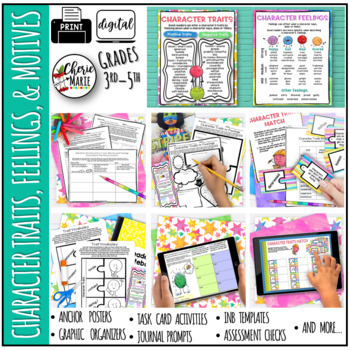 ✔ Character Traits Poster (organized so that opposite traits are adjacent from each other for students' easy reference) This is helpful, especially with characters in fables. ☕ Center Task Cards are already mismatched for your convenience, so there is very little prep time. Buyer wrote- "Excellent VARIETY of activities to teach students about character traits! My students loved these all! I have been using this packet throughout the year because there are so many different activities!" Danielle B. wrote- "This resource is a gem! I've just organized it for the upcoming school year and I'm excited about how much I will be able to use. The posters are laminated and ready to be hung on our focus board, the journal entries will be perfect for independent practice after reading self selected books, the puzzles will be used in my LA games center, and the multiple choice will be used as a post test after we complete this unit. Thank you!" Megan L. wrote- "Awesome resource and really aligns with common core standards!" Jennifer C. wrote- "I loved this bundle! Such great activities and reinforce of skills for my students!" Kara T. wrote- "This does a great job of focusing on the vocabulary to build an understanding of the different character traits and feelings!" Taira R. wrote- "Such a great resource. It has been so useful in my 3rd grade classroom with a high ELL population. Having lots of opportunities to practice in a variety of ways is a true bonus. It's also a terrific resource to include in those emergency sub plans." Michelle G. wrote- "Great for helping understand the difference between feelings and character traits! Thanks!" Elizabeth S. wrote- "I use this all time the with my small intervention groups! Love it!" I highly suggest checking out my Theme & Message Toolkit for continued success in teaching these standards. Needing some Ready-to-Go, detailed lessons to ignite your reading program? All you have to do is print and go!